I started this embroidery tapestry so many years ago that I cannot tell. It was a traveling project, I just made the design as I went along, without a structure, and with the colours I had at hand. And then... many things happened, I did less and less every year, and finally I stopped. 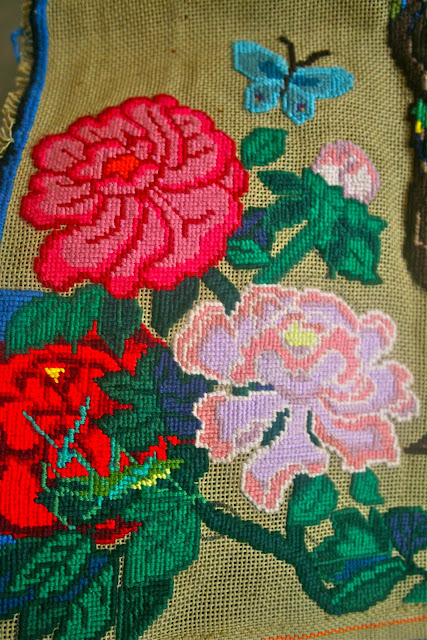 When I was in Italy my Mum took out her own embroidery, I had forgotten about it! 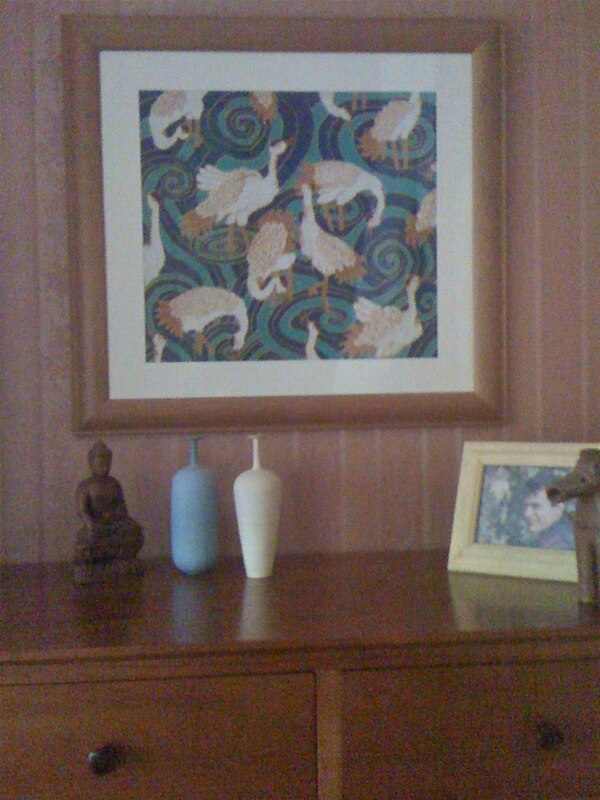 A few years back she asked me to draw a pattern for her on the canvas, and I did. 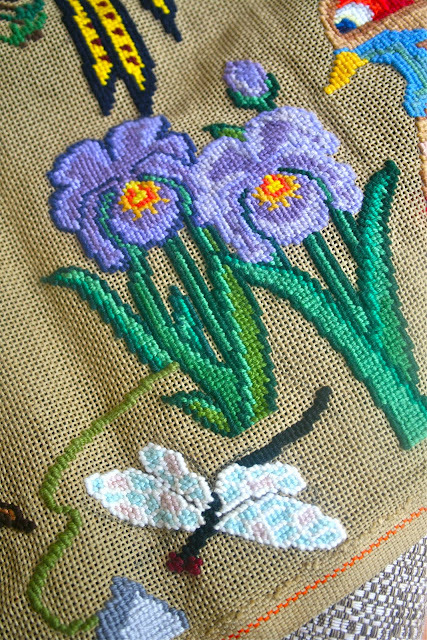 She only had the background to finish, just needed to find some more blue thread. She could not believe that I forgot about it, and mine, as a kid I was very fast at this, of course I used ready made patterns then, and all the thread was provided. But I also had more time, and no computer. I even started to be more 'creative' and plan my own textiles. 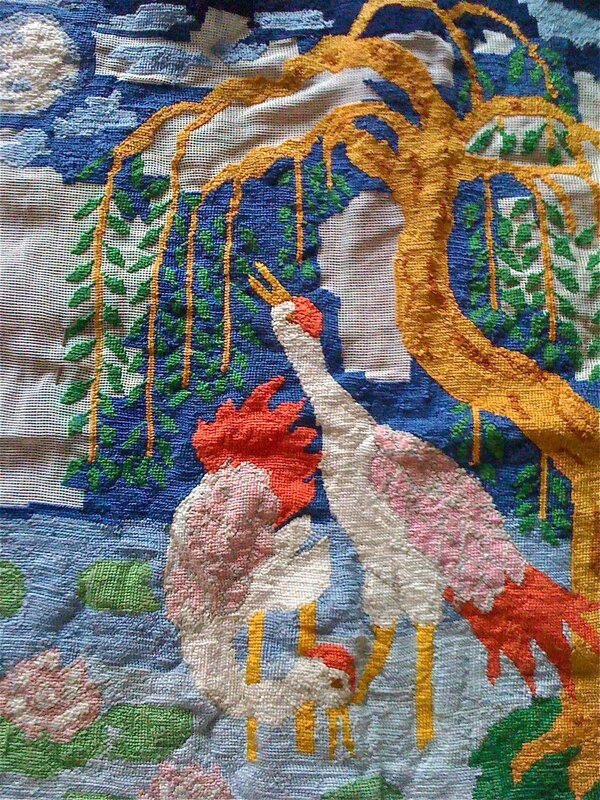 When I was at university studying textiles I designed and made an embroidery on the style of William Morris. It took me two years, and it was hard to find the colours treads (I only used 7 colours), but I finished it, and frame it. It is in my bedroom now, the photos are a bit dark, but you can get the idea. I thought that I could complete my second bird project in a couple of years too. 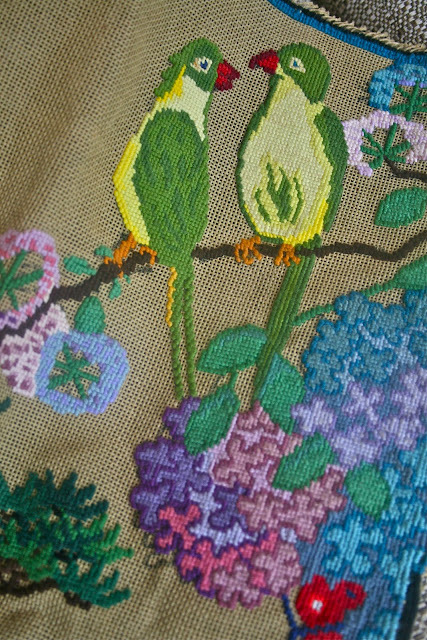 At first it went well, I didn't worry about the design or colours, in fact I invented birds with impossible colours so that I could use the threads I could find along the way. But then I could also carry needles and small scissors on the plane! Then I went to Japan and I started to work a lot, and to weave and dye, then I moved to New Zealand and I got a house to renovate, then the babies came along, and more work, more house stuff, more ... excuses? And now I seem to spend quite a lot of time with my laptop. Even my loom lies there, unattended, like my sketch books, natural dyes, and bags of wool to spin. 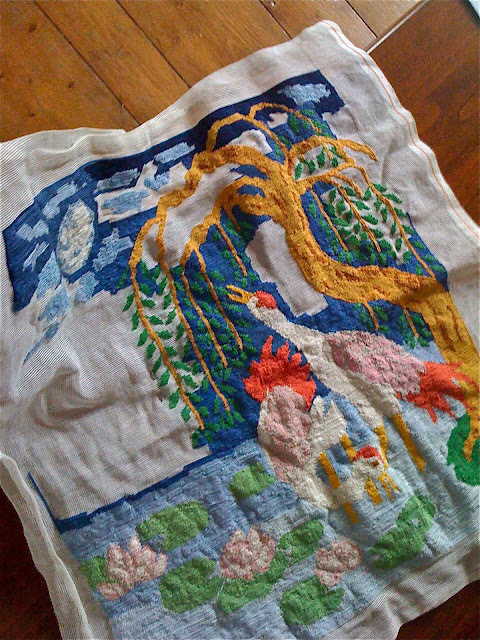 I dug for my tapestry last week, and took it with me to Gisborne. I left the laptop at home. che bello! pensa che questa è un'alra cosa che amo fare...ne abbiamo di cose in comune! bellissimo blog, grazie del tuo passaggio da me, ti seguo anche io! Beautiful. I think this is how I found you - through your crafts rather than through your cooking. @ Mango, :-) Maybe one day I will write books about textiles rather than food, but at the moment I better stick to food or my publisher will get an heart attack! Adoro i colori che hai scelto e sopratutto sei bravissima a disegnare!!! Trovare il tempo per cucire e` di sicuro non facile quando hai una famiglia da seguire. Io ho iniziato a cucire i miei quilt un anno e mezzo fa, prima non sapevo neanche come usare una macchina da cucire, mi stimola l'idea di regalarli. Per Natale ne ho gia` preparato uno e il secondo e` quasi pronto. Si, aspetto i tuoi progressi! E tu approfittane fin che sei nel paese dei quilt!! !